Çirali is in the zone of the Taureses montains which has all characteristics of the Meditarenean region. Although there are two different roads reaching the Olympos ruins and Çirali they share the same bay. Çirali is located between Adrasan and Maden (Atbükü) bays and has the longest beach (3 ,25 km) in the near area. 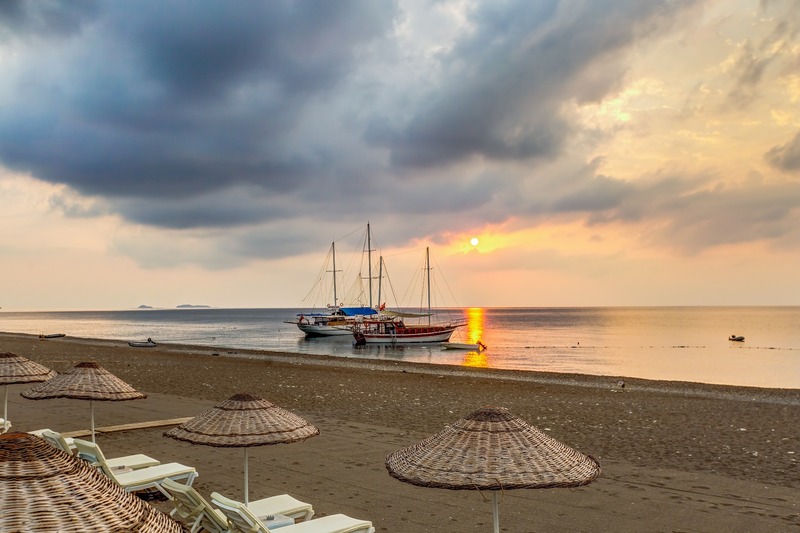 As a beach especially good for swimming Çirali was chosen as the best coast of the world in 2003 because of its natural beauty and cleanliness in a public survey which is done by South Galler Glamorgan university. The plain of Çirali is bordered by Mt. Musa, Mt .Omurga, Khimera and Karaburun. There are paths to climb to these mountains which give breathtaking views for the trekkers.The valleys which are formed among these mountains; the rivers Akçay, Ulupinar and Andizli flow into the sea. The Ulupinar river also supplies drinking water to the area.The water of the Ulupinar decreases and in summer stops flowing totally. Especially in April/May and June the river offers a lovely trekking route with clear flowing water, small waterfalls and ponds to swim in. Yanartas/Khimaria which is in the northwest of Çirali Plain is formed of serpentine and limestone. Because there isn't a fusion in connection points of these two different rock structures, gas leakage (mainly methane) occurs from splits. This rocky area which has been burning for ages, adds magnificent beauty to the region especially at nights and it's at a short walking distance from Myland. Hellenic ruins found very close to the fires mean that the fire region was important in the ancient times also. An English nature scientist described this area as "heaven of flowers" while he was travelling in 1842. This region which encompasses extraordinary richness in a small area with its natural and historical structure was announced as National Park of Olympos Beydaglar in 1979. In 1989 all construction was forbidden to protect the environment.That's why you can't see high buildings and big hotels here. Olympos National Park is the region which has a lot of and intensively endemic species of plants.Only 7 out of 1000 species of plants classified yet. Its no wonder why people interested in herbal medicine and ayurvedic treatments have an special interest in Çirali. In the region which is rich about animal species 73 sorts of birds, about 45 reptile and frog, 56 mammals and 9 amphibian species are inventoried. 12 kinds of reptile species have been taken under protection, especially Caretta Caretta sea turtles. A project carried out in Çirali by the Foundation of Preserving Natural Life, the Turkish Representation of WWF (World Nature Protection Foundation) was expanded taking into consideration the protection of the living and reproducing areas of the sea tortoises Caretta Carettas, the biological richness of the area, the variety of its fauna and flora. Ecologic agriculture has been improved with the request and contributions of the region's people. These studies made for a sustainable agriculture and tourism was awarded the best implementation prize by being one of the best 10 from the 110 countries and 700 projects in the competition organized by the United Nations Commission of Human Settlement (UNCHS) Habitat in year 2000. DHKO (Foundation of Preserving Natural Life) and the Çirali people aim to be a model for the preservation of the present situation of Çirali and leaving it to the next generation. The antique city of Olympos is found 25 minutes walking distance from Myland. Water channels of the ruin which are still working when it rains, end in a pond close to the beach. After swimming you can take shower by the fresh spring water maybe like the ancient Lycians were doing. Olympos name was first seen on Lycian coins printed in II.century B.C. It was one of the three having the right to vote at 100 B.C. As a result of the attacks of pirates usurping free people and capturing and selling them in harbor cities as Side and Delos Olympos lost its population. The Roman emperor Sevilius Isaurieus won the battle against pirates in 78 B.C. With the Roman pax (peace period) Olympos was shining again with Phaselis. The region was exposed to Arabian attacks and since the middle of 7th century lost its importance and economical power. Knights from Venice, Geneva, and Rhodes in the middle Ages area had some economic life for a short period of time. After 1056, Turkoman clans which were rushing in crowds to the region settled in the mountain area because they found many settlements abandoned apart from Attaleia (Antalya) After Ottomans, Olympos was abandoned in 15. century completely. Sea is clear and calm beginning from March to mid November. It gets deep after 5-6 mts and seashore is a mixture of sand and stones. Sea water temperature is around 18 centigrade in March-June, 26-28 centigrade in July-September and 22-24 in October-November. All climate characteristics of the Mediterranean exist here. Wonderful streams flowing with a loud, roaring sound in the spring, the lovely scent of the orange and lemon flowers will make you drunk. The summer months are hot but you'll feel the coolness just after the sunset. If you want to feel the bronzing Mediterranean sun; June, July and August is ideal for you. Spring and autumn is more suitable for trekking /yoga/cycling/rock climbing.